In my cupboard is a lovely set of earthenware dishes. They are blue and white with scenes of different castles and little flowers and leaves circling the outer edge. 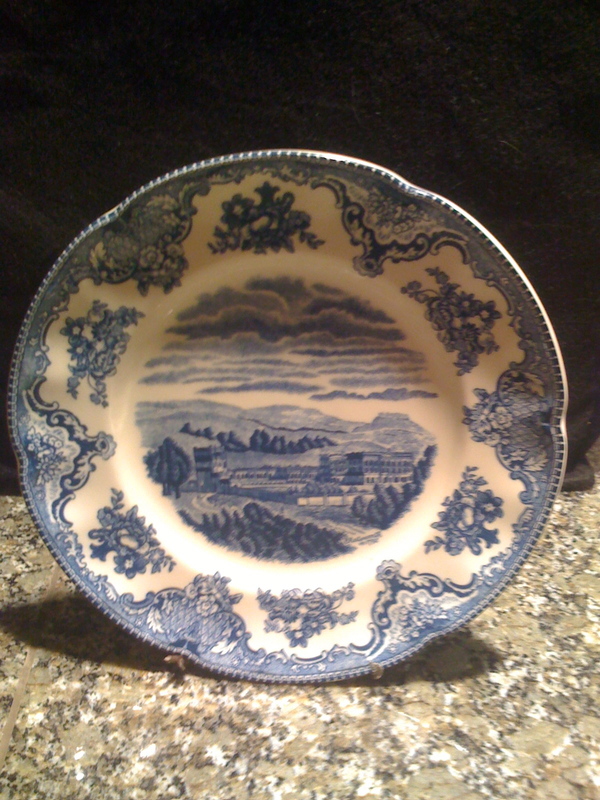 The pattern is Johnson and Brother’s Old Britain Castles. Sometimes when I’m having a cup of tea, I stare into the distant castle-scape and imagine myself in a little white farmhouse with a front porch and white picket fence. My kitchen is decorated in white and blue with lacey curtains. Through the screen doors birds are singing and I can see an apple orchard in the distance. The caffeine brings me back to the Brady Bunch 1970 reality that I live in. Somehow, I married the man with a penchant for 1970’s homes. Weird, inexplicable architecture–he loves it three times over. Open concept, boxy awkward rooms–he loves it. Me? I–hate it. It’s not like he forced me to live in these places. No. He just kept falling in love with houses in GREAT locations, and I am a practical kind of girl. So, here I am. Great location, crappy Brady Bunch house. Yes, if I were to put myself in an old sit com, it would be the Waltons. I would live in that big, airy farmhouse and gladly yell “Good night, John Boy.” I could feed chickens, muck out stalls and even help at the sawmill. Yup. I could do all those things, except I’m in suburbia. As you may have read before, I rebel in little ways. I wear clothes that people refer to as “grandma clothes.” I have a love affair with the “grandma car” and I also possess the “grandma plates.” I serve dinner and snacks and tea on these blue, old-fashioned beauties. Sometimes I even see my plates in antique shops and e-bay auctions. They really are the best plates. They are light and durable. They go in the oven, the dishwasher and the microwave with no fuss. As I’ve said before, there’s a reason we all love our grandmas. This entry was written by Mermaid and posted on October 21, 2008 at 7:50 pm and filed under Grandma, Mermaid, The Real Me with tags Brady Bunch, grandmas, Johnson and Brothers, Old Britain Castles, old fashioned plates, the Waltons. Bookmark the permalink. Follow any comments here with the RSS feed for this post. Post a comment or leave a trackback: Trackback URL. My house is way too modern for my taste as well. However I am trapped by a beautiful view, incredible garden and no mortgage! And I too use and love my grandma’s plates! Hmmmm…I have no view, no garden AND I have a whopper of a mortgage. Well, after next Sunday you can just call me grandma, honestly, anyway. I’ve been a grandma trapped in the screenplay of my life all my life. Maybe my kids will make me honest someday.